Write your own haiku to enter to win your own copy of Kodomo’s Still Life! Ambient & electronica represent a musical compromise with technology and modernity, one that humbly acknowledges that even with the repetitiveness and surface level contact afforded by the pace of urban working life, it’s still life. Kodomo’s first offering is thin, but still life. Minimalist Chemical Brothers, Kodomo’s Still Life occupies a useful place between that hard charging, beat driven play on sound and Enya. For my money, I missed the fullness of base and find the higher pitched electronica grating without something to tie it down. The first two songs raise the energy, stir it with staccato, uneven strokes that generate a feeling of anxious tension which is then drawn down through the ensuing seven tracks. Still Life is a concept album that starts with compressed intensity and lets the lid off. But the intensity wasn’t channelled enough to have produced gemstones, instead we are left with faux pearls. Still pretty, still life. I won’t be doing yoga to this CD; the high pitched staccato percussion halts rather than smooths the breath. I use music when I practice for it’s energetic quality, and this album has no quality I want to absorb fully. That said, I appreciate it in the same vein but with less intensity than Charles Ives or Kronos Quartet, who also work with minimalist, experimental, abstract, concept driven music. Kodomo, whose given surname is Child for which “kodomo” is Japanese, used photography as his inspiration, each track motivated by an image. The images included in the artful jacket are spare, repetitive, everyday images of the technological infrastructure of our lives. The telephone poles and phone lines of the images are mirrored by the recursive, inter-referential rhythms of the tracks. I had the feelings both of driving the loneliest road in the country at night – East out of Clayton, NM there isn’t even an AM radio station to break the constant drone of rubber on asphalt, and of the sound that a hyperspace being would make on Star Trek. An odd juxtaposition that makes sense only in a state home to the Roswell Alien phenom. My husband said he might play it at the Boxing gym but otherwise “It doesn’t take me anywhere.” And maybe that’s the point of ambient electronica: to give the illusion of motion without moving us to anywhere new. If you’d like to review this album yourself, or want to take a stab at the meaning of “alkaloid recreation” in the above haiku, then drop me a haiku about ambient music at christine at yogaeveryday dot org. 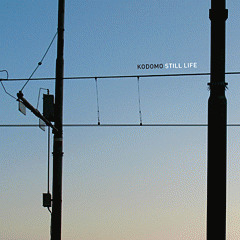 The best two (as determined by me & my husband over tea while listening to Kodomo) will win a free copy of Kodomo’s debut album Still Life, just out. Enter as often as you’d like, but be sure to leave me contact info so I can justly reward your efforts. This last year I’ve been re-working the conditions of my life to support more yoga – more asana, yes, but also more “steady & sweet” as in “Yoga pose is a seat that is steady & sweet (or with ease).” Changing schedules, duties, what I think I need, really digging in to what’s important – really crucial – to my best life. Changing eating, sleeping, all sorts of habits. And what I’m finding is that my very desires are changing. The things I used to want to want, used to want to have time to want, energy to want, these are the very things I wake up ready to do. And my fears, the very ones that kept me from doing this earlier in my life, were unfounded. I used to fear that I would become soft, pampered, non-productive and have less substance if I created these conditions. But it’s the opposite: I am not only clearer of head & heart, but more productive, more energetic, muscular of body & mind, more discerning and less in need of pampering to feel like my well is full. Yoga has changed what I want and how I go after it and given me what I wanted all along. I just had to let go of a lot and trust not only my practice but my deepest driving desires for wholeness and simplicity. The Upanishads say that our deepest driving desires are our destiny, and I’m beginning to see that destiny has more to do with what you allow than what you plot, that resistance is almost always a sign of imbalance and that it’s more powerful to soften to resistance than to cleave it. When we soften, we bring awareness & breath, attention and the potential for transformation. There is enough time, because there is the part of us in time and the part of us that participates in creating it, and for that part of us there is no limitation and so no concept of “enough” or “not enough”. In consciousness, there is only Being. I asked Hillary to guest blog on the occasion of releasing her first DVD, Yoga Foundations, because I’ve loved taking her podcast class at HillarysYogaPractice.com. Her spirit really shines through and her class themes have integrity and depth. When I chose to step into the process of making my first yoga DVD earlier this year, it sweetly reminded of how my life’s challenges have brought me my greatest gifts. In 1996 at the age of 24, I was seeking a way to become more of myself when I was presented with a huge challenge and gift – a diagnosis of Multiple Sclerosis. With this diagnosis, I thought life was over for me, but there was a call to the yoke, to begin my practice of yoga. Early on in one of my yoga classes I heard for the first time that my blessings were hidden in my challenges. At that moment my journey of healing began, there was no turning back – I chose to embrace my situation, commit and connect to my power through the teachings of yoga. Like any practice it takes time to find our way and stay focused. In yoga the body forms with breath, attitude, alignment and action and grows every time you come to the mat. Yoga has prepared me to see that all of my experiences are part of my foundation (good and bad); they are all there to support my process to uncover my authenticity. One of the best gifts my diagnosis offered me was the choice to shift from working in the fashion industry in New York City to study and then teach yoga in Los Angles. After a few years of teaching, I took on a new challenge and expanded into producing my Yoga Podcast, Hillary’s Yoga Practice – this totally was scary for me. I had to take on the obstacle of learning the technology but then discovered hidden in this challenge that yoga is also technology. Now after almost 2 years of producing my podcast, yoga helped me once again to embrace this next challenge to produce the DVD. While in pre-production, production, up to the day of shooting, I was living on the edge, holding steady, doing my best to not retreat from the fear of the unknown. At this point I am able to be grateful for all that I have learned over time. As I moved through my obstacles more would appear and by embracing them, it becomes easier to use them as a roadmap for my own growth into becoming more of myself. Here are 3 steps you can use to begin to discover the gift in your challenge and become the best you. You are invited to do this daily, weekly or monthly. Please keep a journal by writing lists or creating some other visual image as a way to help the mind and body connection. 1. Embrace your challenge by practicing gratitude. 2. Empower yourself by asking what you can learn from this specific challenge. 3. Evolve into the best you and uncover the gift. Hillary Rubin , a certified Anusara Yoga teacher has taught nationally and internationally including Yoga Month 09 Tour , Agape International Spiritual Center’s University/UTSLA, Paramount Studios, City Yoga , and the Mind Body & Beyond Expo. She is passionate about sharing her story to inspire others to become empowered through life’s challenges and has been featured by Fit Yoga Magazine, Conscious Choice Magazine, Whole Life Times, Lime.Com , Yoga Mates, and Yoga Peeps. Yoga is about big ideas & everyday moments, making the theoretical practical and living out ideals. That’s why a great class has a theme that permeates each pose, each sequence and acts as a guide, a stabilizing influence behind all the fluctuations of mind and breath that a class allows us to observe. Yoga is applied philosophy, a living, breathing wellspring of wisdom we discover fresh for the first time over and over again. Business is all about bringing big ideas down to earth and bringing them to life, setting roots and growing between Earth & Sky. You don’t have a business unless you have an idea, a way to implement it and an idea of what it’s worth and how you’ll exchange your idea for money. Now when I started in business I knew I’d need to write a business plan, set up accounting, do marketing on almost no budget, set up times and places… all before I would have the chance to let my ideas shine. What I didn’t know was where I was going to start. I mean, writing a business plan requires you know answers to the other questions, and answering each of those questions requires assumptions about how you’re going to answer all the other questions…. It’s enough to make your head spin. It has mine. When I asked people I knew who were already doing things in the areas in which I was interested, I received variations on “You know, you just start. It all falls into place.” While reminiscent of the Nike “Just do it” mentality, I found this hopelessly disappointing. The only sense I can make of it even now is that either they’re winging it themselves, or they’re wary of competition. I find this sad, because if there’s one thing I’ve noticed it’s that life isn’t a zero sum game. Some of the best advice I’ve gotten is from someone in a wholly different industry. We work together as Paramedics and have each created ventures of our own, and his advice is the most yogic I’ve received. Five years he said. Give it five years to grow. Start slow, adjust, re-adjust and refine. Be patient. And while you’re being patient, acknowledge your limitations and when you aren’t ready to meet a particular need, refer people to someone who can. Serve your customers, your potential customers, your colleagues, remember you are in business to serve. I’m in my first year, so according to my friend I’m about 20% there, and I’m adjusting plenty. I’m also keeping track of my lessons and solutions to share with yogically minded business persons, in any industry. Stay tuned for more. For now, my advice is to start with pen in hand. Start with your mission statement. It should be big enough to inspire and specific enough to guide your next steps. Next, start tying down the legal stuff – believe me this’ll make your life much easier as you grow. No matter how small a hobby, you’ll be surprised later what kinds of legal obligations you might have created for yourself (hint: gross receipts tax). Legalities change with your municipality, so start by asking what you need for a business license. This is part of satya & saucha, maintaining clarity & transparency and acknowledging you’re part of a community into which you are bound by ties of responsibility and mutual interest. After that the interlocking network of questions is what you take slowly. 3x5s are your friend here because you can answer questions, put them in context, throw them out, change them, see how they change one another. Accounting affects marketing affects time and place affects what you’ll be able to create affects what you’ll attract affects… you get the idea. So, yeah, just start & it all falls into place. Just be prepared to watch it morph and fall apart and come together again over & over while it’s all “Just falling into place.” Like any yoga pose. That’s me. All organic & American-made, domestic even. 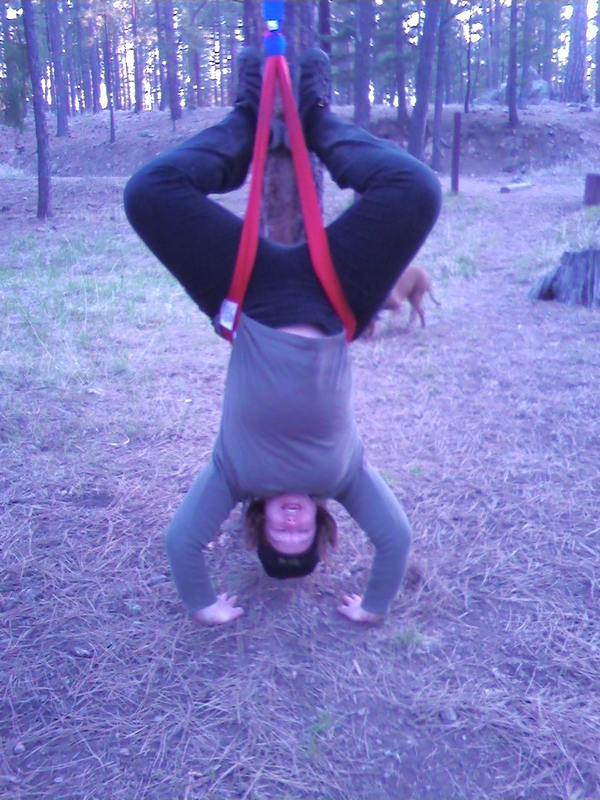 Last week YogaCowGirl wrote about her commitment to organic husbandry of her land, food & environs. What she didn’t focus on was the painstaking, time-consuming, heavily documented process required to be certified organic. She’s shared some of her process on her blog & on Twitter. The process is impressive and represents a real investment in the value of organic food and land. The yoga of food involves our consciousness of what we ingest, literally as well as metaphorically, how we ingest it and how the whole system interacts to support the beauty of existence. The leap to textiles isn’t far – most of what we wear is fibre of some sort and we choose what feels good. Maybe our choices are guided by what’s at hand, or schedule or activities, but among the options available, we gravitate towards what feels best for the conditions today. Now there’s a lot of reason to choose among what’s at hand or when we buy to buy second hand. Consumerism is itself a choice that reflects and interacts with how we create our worlds. When we do buy new, however, how much thought do we give to where our clothes came from? I must confess that as much thought and effort I put in to an all organic kitchen, I’m spotty at evaluating my clothing choices. I’m guided more by convenience than thoughtfulness and my prior attempts to investigate practices behind my clothes led to so many complicated answers that I essentially gave up. More than that, when I have bought organic the fit degraded with the slightest movement, and if there’s anything my clothes have to do, it’s support me in a really active lifestyle. (btw: stay tuned for a review of the latest YogaPaws… hint: great for motel room, or the first 10 sun salutes outdoors). So, when a representative of a new yoga clothing line contacted me today, I was really impressed with his knowledge and their attention to detail. He had simple, straightforward answers to my questions about production and green quality. They’re no newcomers to women’s clothing having started in maternity and have a clean, well-organized website: renuyoga.com . What I want to know from you, dear reader, is this: have you worn any of their clothing? How has it stood up to your practice? Have you hiked in it? How did it hold up to washing? How long did the seams hold up? And what do you think of their styles? Leave a comment, email me, call me (505-506-0136), let me know about your experience. And more than any single clothing line, I’m interested in your views on organic food, clothing, homes. How much thought do you give to organic materials and food? Has it made a difference in your life? Is your interest in manufacturing practices sort of theoretical, non-existent, or all consuming? The veil of confusion and the difficulty of getting the straight scoop on such things can thwart the most stalwart of conscious consumers. What have you done to ignite the forest of obfuscation between us and the materials of our worlds? Welcome to a new monthly feature, the guest blog. Craving community , practicing letting go and so continually amazed and inspired by the creative beauty of fellow bloggers and yogis, I’ve invited some of these artists of life to share their work here. I hope you find them as igniting as I do. Stay tuned for installments from Hillary, Amy & Elsie… and more to come! YogaCowGirl shares her eclectic and grounded mix of yoga, music, chanting, farming and husbandry through her artistic wordsmithing on her blog and on her CDs. Just witnessing her productivity and clarity will help you find your own. Here’s her reflection on effort and stillness as the yoga of husbandry. Enjoy! For me, yoga practice has been a quest to pay attention. Yoga meditation helps me pay more attention to my relationships with others, to slow down and breathe rather than have knee jerk reactions to the words and actions of others. Hatha yoga helps me pay more attention to the body, to which muscles need loosening or strengthening, to where tension is creeping in, to the effects of food on my well-being. The study of yoga philosophy helps me learn more about the world around me and how science, philosophy and practice can improve life for me and others who connect with me. As the owner of a 40 acre property, I pay attention to the land and its cycles as well. From year to year, we see the effects of global warming as trees bloom earlier every year, as wet summers beset our typically Mediterranean (dry summer) climate, and as winter storms grow increasingly violent. Paying attention to all these macro environmental changes, in fact, provides this yogi’s call to action to steward the land. If I care deeply for the land, then I must do the most I can possibly do to stop aggravating global climate change. Sometimes stewardship means just leaving the land alone. Last year, we put a conservation easement (http://www.trlc.org) on 19 acres of forest to ensure that future generations would leave the land, its trees, and the stream running through it — alone. Our job now is to simply pay attention to the forest, assist in a few ways (like removing invasive weeds), and allow it to thrive. Sometimes stewardship needs to get more active. In order to be as responsible a world citizen as possible, I decided to go completely organic on the entire property, including the remaining farm acreage. We passed our third organic certification inspection (http://www.tilth.org) this year, and happily added every flower, shrub and tree growing here to our certification list of plants that we are allowed to label “organic” when we sell them. Being organic means I have to pay much more attention to my crops and plants than the typical farmer does. I cannot pre-spray for anticipated pests or weeds, like big agricultural operations do. I must hand pull every weed and use non-toxic soap on pest infected plants. I also use predatory insects that eat pests and then leave the site to integrate into the land. Predators can only be applied at the moment a pest is attacking a plant or they won’t have anything to eat. I rotate crops to “fool” pests into thinking their food source has left the area and to distribute the feeding needs of various crops. This attention paid to plants develops my love for them and for witnessing their life cycle. Keeping the property free of harmful chemicals has invigorated our bird, bee, and insect population. We feel that the property is becoming an oasis for life through our actions of stewardship and attention. Isn’t that what every yogi wants, to be an oasis of life, of calm, of peace on this planet so that we may help bring others to drink from our waters of self and be calmed and invigorated? Sometimes savasana is the last thing I want to do. I rarely miss asana in the morning, and like I was reading in Iyengar’s Light on Yoga this morning, I find meditation in the union of breath, body & mind. Even if it’s 10 or 20 minutes after walking the dogs & before donning the uniform, me & my mat meet and movement and meditation are one. And there are some mornings, like this one, when, after my last downdog or urdva danurasana, I am tempted to grab my glass of tea and head for the door, beyond which errands, pagers, sirens, and dogs await, their calls silent but insistent in my mind. And I manage a turn and a grab before…. I realize, I’m already ahead of myself. Not coinciding with myself. What is all this about if not that, that feeling of coinciding with my body, my idea of myself and my feeling of myself. Deep breath, back to the mat – back on the mat, looking up, eyes close, hands release. Lists. Notice the lists, ahhhhh…. slip instantaneously into the space between the lists and the noticing, bliss. Sitting, breathing, “Oooooommmmmm….” My body absorbs and becomes the sound, as if thirsty. “Ommmmm….” So worth it, all for this.